Hollybeary Creations : NND Feb Release Day 2! NND Feb Release Day 2! Hello everyone.. I hope you enjoyed Day 1 of our release at Newton's Nook yesterday! We have some more great sneaks for you today and another chance to Win! Today we are showcasing the Beautiful Spring set.. 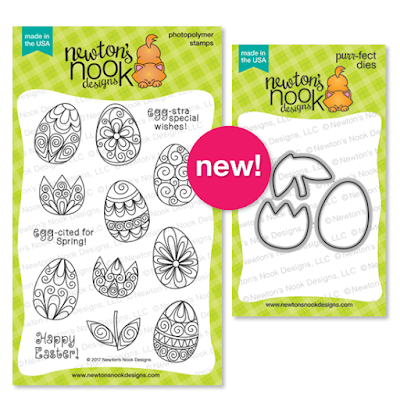 This is a Gorgeous set that's perfect for coloring and several fun techniques. I created a background using a die cut from some White card stock and then I layered it over a Kraft top folding card base. I die cut a photo frame shape from an additional piece of Kraft card stock. I created a background with some Distress Inks and I used the new Land Borders die set to create the grass. 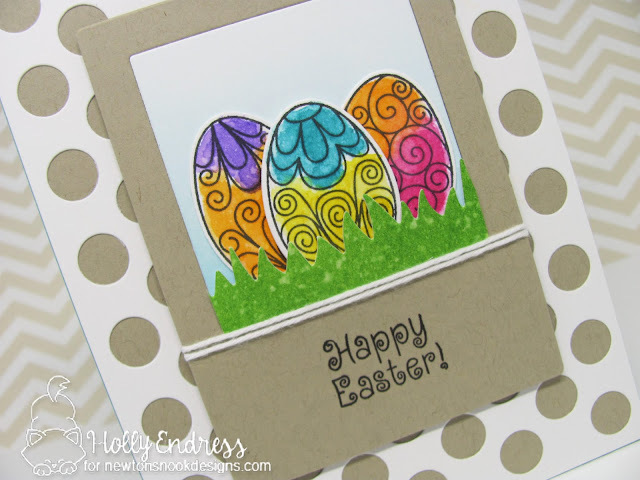 I stamped each of the eggs onto some Watercolor paper and die cut them out with the coordinating dies. Then I colored them in with Distress Inks. I love how vibrant the colors are. 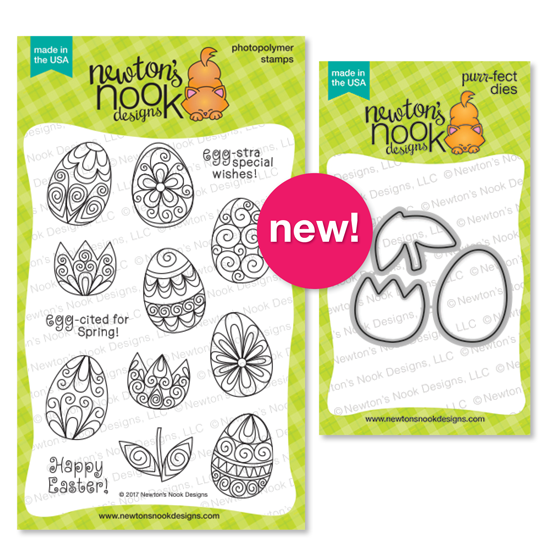 Would you like to win the “Beautiful Spring” Stamp Set? Comment on the NND blog and Design Team blogs (see list below)! The winner will be chosen at random from the collective reveal posts. Make sure to check out each of their blogs and comment for your chance to win. You will not know which blog has been chosen so the more you comment on the better your chances are of winning! You have until Thursday February 16th at 9pm CST to comment -- winners will be announced on the blog post on Friday, February 17th. Love your card! Great coloring and the dotted background is nice. Beautiful way to highlight those gorgeous eggs on a subtle background..lovely effect! Wow, I like your card! Lovely colors!! just beautiful. Love the decorated eggs & tulips. Beautiful card, love those stamps!! Great card. The eggs are so cute. Oh my goodness, your cards is so awesome....I love the polka dots too! Great card, I love this new set! What a fun card! Love how those colorful eggs pop off the kraft! Very pretty card and nice spring colors. This set is so sweet Holly and so is your card. Love the designs on these eggs. So fun! Darling card! Love the way you colored the beautiful eggs! Love that grass die cut too! The Tulips and eggs are just beautiful! Wow! Love your gorgeous card!!! Beautiful Spring Set is adorable!!! Adorable cute and so spring feeling!!! Love the eggs and the colors you used! 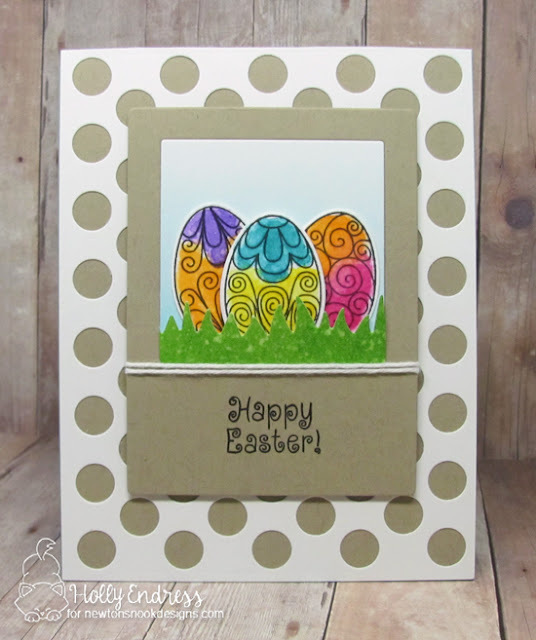 This card is so pretty, reminds me of freshly colored eggs in an easter basket! Those colors really pop off the white and Kraft paper! love it! Very cute. I like how you colored the eggs. A pretty lay out to your these stamps!